Listen up brides and bridesmaids to-be! Bridesmaids look can beautiful without outshining the bride. Watters & Watters is a Dallas-based bridal company that offers bridal and bridesmaid dresses in every color, size (0-24), and style imaginable. They offer 2 lines: Watters and Wtoo for gorgeous dresses at different price points. All their dresses are pretty, and I would know because I got to try on and style some dresses at the Watters studio. As a future bridesmaid (in my cousin Christine's wedding), I was excited about this photo shoot for WEEKS! With the help of Watters PR guy David Lopez, my photographer du jour Elizabeth West, and Watters intern Scarlett Taylor, I was able to look like a blushing bridesmaid. 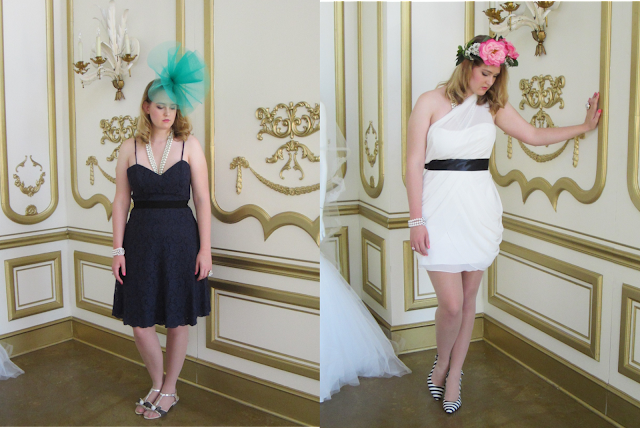 I've broken up the dresses into 4 categories for each type of wedding. I hope you enjoy. Pearls are always elegant and won't take attention from the bride. Have fun with your shoes. Even if you have to wear a certain color, there are lots of styles you can pick from. But you might want to make sure that they're comfy so you can dance! Spend your money on the dress, not the accessories. Wear a big cocktail ring with faux diamonds. They look rich but don't cost a lot. But always keep this important rule in mind: don't outshine the bride!